Urbanization can cause detrimental changes to the hydrology of natural features, such as wetlands, woodlands and watercourses. These changes are manifested as serious problems such as significant vegetation shifts, altered habitat conditions, and flooding and erosion issues. Toronto and Region Conservation Authority (TRCA) and Credit Valley Conservation (CVC) are working together to better understand these processes and mitigate the impacts. The featured pictures depict the effects that changes in hydrology can have on natural features. 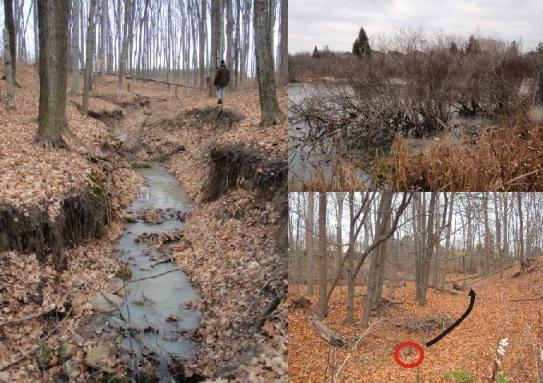 Left: major erosion issues in an ephemeral stream caused by inflows from a stormwater pond; Top Right: Red-osier dogwood swamp thicket decline in a Provincially Significant Wetland following flooding due to stormwater flows; Bottom Right: Photo of a woodlot that suffered from canopy die-back, windthrow, and secondary diseases following urban development within the catchment. A watercourse historically traversed the woodlot (black arrow), but now all flow is diverted to catchbasins (red circle) and sewers. Hydrology is a key factor that determines a natural feature’s ecological composition, structure and function. The physical and functional characteristics of a natural feature are determined based on its particular combination of key environmental variables (e.g. climate, geology, hydrology, landform, soils, and disturbances). The many combinations of these variables are what results in woodlands, wetlands and watercourses, the array of communities they contain, and the functions and ecological services they provide. Hydrology directly affects the physicochemical properties of natural features including oxygen availability, salinity, toxins, sediment movement, detritus, and soil composition. Because hydrology is important to natural feature functions, changes in hydrology can result in negative impacts to these features. Largely due to the increase in impervious surfaces, development within a feature’s catchment can cause decreases in infiltration and evapotranspiration, and large increases in runoff volume. Developments that extract or divert groundwater from natural features can also be problematic. Depending on the development form, design and construction, some natural features may become wetter, while others may become drier following land use change or development. These changes in hydrology can cause changes in quantity, quality, volume, duration, frequency, timing and spatial distribution of water input, which in turn cause changes in vegetation communities, habitat conditions, flooding and erosion. Measures to protect the existing water balance are necessary when there is likelihood that a proposed development will impact the hydrological functions of a feature. A water balance analysis is required in order to demonstrate that hydrological regimes and hydroperiods will be maintained in the post-development scenario. A number of partners have been working on various initiatives to advance our understanding of the hydrological impacts of urban development on natural features. For more information on these initiatives, select at category from the right side bar.